The main picture that opens this years calendar shows a young Frederick Williams standing in the doorway of his shop at 148 Victor Street around 1915. Frederick was born in 1894 to John and Annie Williams of Arundel Street, the youngest of their seven children. In the 1911 Census Frederick’s occupation was listed as boot repairers, just four years later at the age of twenty-one he opened the premises shown for business. It would appear that the business did not stand the test of time. The Walsall Red Book for 1915 lists the business but one year later, and for several years following that, there is no record of a business under that name or occupation. One possibility that his name does not appear in any later editions of the Red Book is that he may well have been enlisted into the armed forces during the First World War. As well as all the usual items for sale expected in a boot makers and repairers it seems Fred was ready for the slack times too. In the window on his left there can be seen examples of postcards of famous actresses of the day like Gladys Cooper and Carrie Moore that supplemented his income during the quiet times. The coins shown at the bottom of the page total 2/9d (14 pence today) enough to have a pair of gents shoes soled and heeled. The picture in the bottom left shows a flood in Lord Street, Palfrey, just a short distance from Fred’s shop. This flood took place on 14th July 1931 after a severe thunderstorm. Fork and sheet lightning provided a dazzling display for several hours accompanied by torrential rain. The only building to be damaged during the storm was the Royal Oak pub in Ablewell Street whose chimney was dislodged and finished up in the fireplace of the bar. 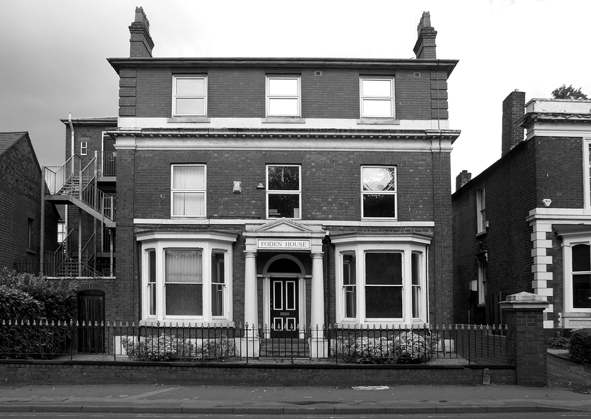 The main picture on the page above focuses on the building that housed The Victoria Nursing Institution on Lichfield Street. 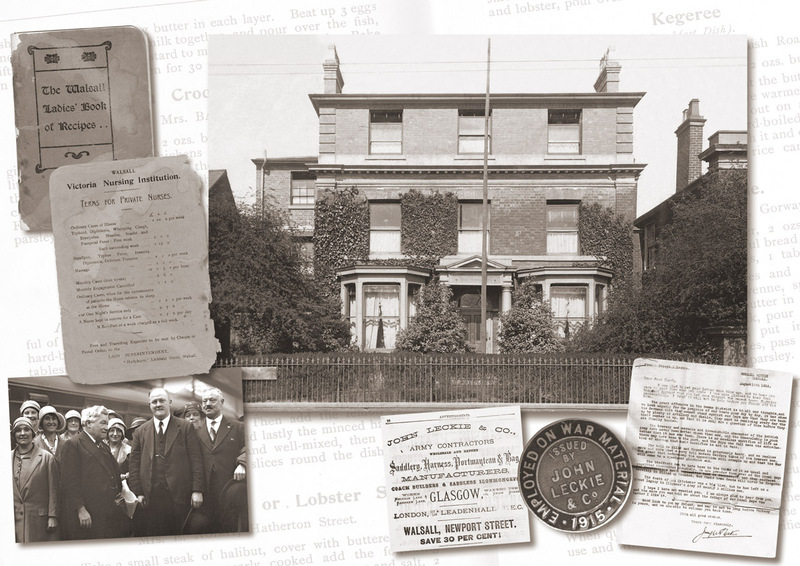 Originally a private residence, near to Queen Mary’s Grammar School, and known as Chaddesley, it was acquired as a permanent base for the Institution in 1906 thanks to the combined efforts of local businessmen John Leckie and his son Joseph. Victoria Nursing Institute building in September 2011. Founded in 1897 to commemorate Queen Victoria’s Diamond Jubilee, its principal object was to provide nurses to attend the sick poor in their own homes, and also to provide private nurses for paying patients. In an effort to raise funds to finance their work the Institution produced a book in October 1905 entitled The Walsall Ladies’ Book of Recipes. The cover and inside back pages of the publication can be seen to the left of the main picture. The one page shows the prices charged for supplying nurses to paying patients ……. and the service wasn’t cheap! The Institution existed until 1954 when the Council took over the premises. In 1960 it was converted into Health Department offices and later a day nursery. At the top of this column the same building in August 2011. Joseph Leckie was born in Glasgow and did a huge amount of philanthropic work in his adopted town, as well as his political endeavours at both local and national level. He was first elected as local councillor in 1916, becoming Mayor in 1926 and in 1931 became MP for Walsall. The picture above shows Joseph (with white hair) surrounded by unknown supporters as they wave him off …… or welcome him back from a trip. Always a busy man, he managed to find time to reply to a letter (see bottom right) written to him by serving soldier Jack Clark who had been the victim of a gas attack in 1916. When John Leckie & Company started business in Walsall in 1872 their first premises were in Newport Street and the small advertisement from 1876 Sutton’s Directory confirms this. The featured picture for this month is of Wednesbury Road, Pleck, taken from its junction with Hillary Street circa 1912. One can almost hear the clanging of the tram as it rattles back to the town past the Hope and Anchor on the corner of Oxford Street. The chap on the upper deck right has spotted the photographer and is determined to see what’s going on and get himself in the picture. A chap on his bike riding home after a hard day is skilfully about to avoid the horse manure in his path…. and the tram lines. Another fellow is leaning against the lamp post contemplating whether to have a full manicure or just have the cuticles done ……. always a big decision for the ‘workin’ mon of Worsul’ …… or maybe he’s just waiting for the pub to open! In the bottom right of the main picture is a Silver King cycle lamp made by Joseph Lucas Limited of Birmingham. There were several manufacturers of this type of carbide lamp and they stayed in production for many years. In 1907 the Silver King was selling for 10/6d or 52.5 pence. Similar items in online auctions today are fetching over one-hundred times that, depending on condition. One industrial site that dominated Pleck was the gasworks seen in an aerial view in the top right. Opened in 1877 the gasworks supplied the town for around one-hundred years before closing. The picture below that shows an extension to the gasworks which opened in December 1936. The smaller picture by the lamp shows a tram travelling towards Wood Green along Bescot Road around 1912. In the bottom left corner is an invoice from H. Page of Kingsley Street, Pleck for goods supplied to a Mrs West. Even after she had paid over one pound she still owed more than she started with that day. This month’s main picture shows the windmill in Highgate circa 1904. This building has graced the skyline for around two-hundred and forty years and remains one of Walsall’s most interesting buildings from the past. It stood in the grounds of Hope Cottage which was bought by Moses Eyland founder of the Eylands factory in Lower Rushall Street. Hope Cottage, pictured top right, was rebuilt around the mid-nineteenth century but the name remained even though it looked anything but cottage like. In 1900 the name was changed to Hopelands, a few years later the Eyland family left the house which remained until the mid 1980s when it was unbelievably demolished and replaced by flats. In the 1920s the windmill was bought by George Skidmore also a buckle manufacturer. He converted the mill for use as an observatory installing a large refracting telescope. On the left of the main picture, the house with the white frontage, now demolished, was also owned by the Skidmore family. Just a short walk through the gully adjoining the mill brings you to the junction of Follyhouse Lane and Sandwell Street, opposite the White Lion pub, at the rear of which stood another windmill. Sadly nothing remains of this second mill. 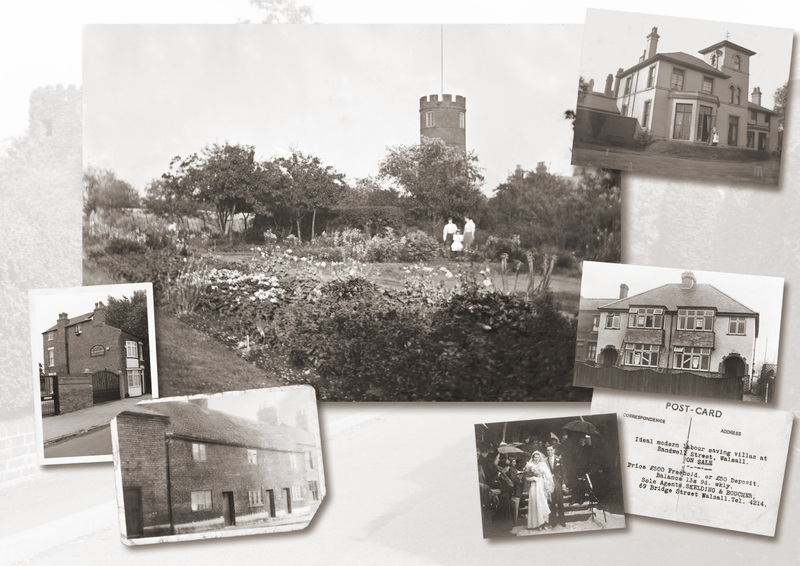 The small well-worn picture in the bottom left shows the cottages that stood where the partially built Sandwell Villas 2007 now stands. Prior to this several lock-up garages occupied the site. A little further down Sandwell Street are two ‘modern’ semis, 215 and 217, built around 1935 and pictured bottom right.The agents Skelding & Boucher had them on the market for £500 or £50 deposit and 13/9d weekly (67p). In the early 1940s, 217 became the home of Stanley and Lilian Russell whose snowy wedding day at St. Michael’s Church in January 1941 can also be seen. The house remained in the Russell family until 1984. The fine picture that takes centre stage for this month shows Bridge Street looking towards The Bridge. What an elegant street it looks too, certainly giving the impression that Walsall was a far more affluent town one-hundred years ago than it is today! The architecture looks stunning in the bright sunlight that highlights the facades of the buildings on the right hand side of the street when this picture was taken around 1910. One building that is particularly ornate is that of the long gone music dealers H. Taylor & Son, their billhead was equal to their premises as can be seen by the one illustrated in the top right and dates from June 1926. The two smaller pictures top left show Bridge Street at the time of The Queen’s visit in May 1962. The postcard at the bottom of the page shows a similar scene some years later when cars were beginning to dominate the scene as opposed to ‘th’ode ‘oss and carts’ in the earlier picture. 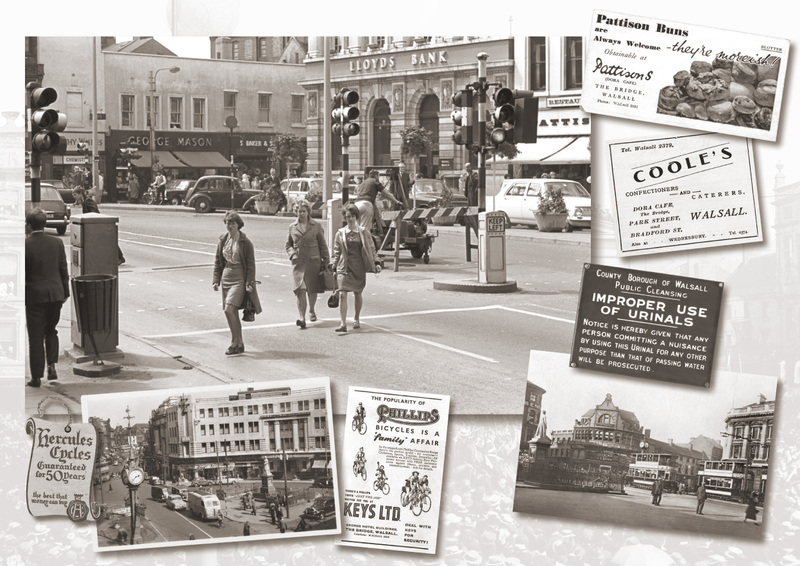 The light coloured building on the left of the postcard housed the departmental store Greys in those days. An advertisement for the store is shown above the postcard and dates from the late 1960s. Next to that is an advertisement from the late 1950s for the tailoring firm and men’s outfitters, Leonard Neasham, a familiar name to many town residents. 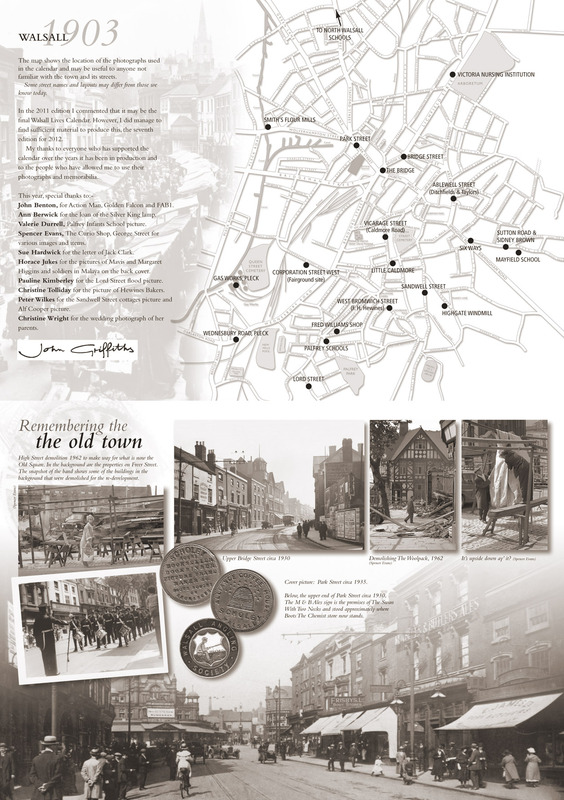 They were situated at the bottom of Freer Street and their shop front and part of their name can just be seen on the extreme left of the postcard. Not particularly obvious on the main picture but more apparent on the postcard is a building few will remember, the Bridge Street Chapel, the top of which can just be seen after the Greys building. After closing as a place of worship the Chapel became a Ministry of Pensions office until its sale to developers in 1966. The unusual picture that takes centre stage for this month shows a peaceful scene on a sunny day along Sutton Road around 1920. It is unusual to see Sutton Road from this vantage point as the more usual view looks from Six Ways up the road, as can be seen by the smaller image top right. Looking at the picture above, taken on a similar day in July 2011, not a lot has changed. The high wall that separated Spring Hill and Mayfield from the outside world has now gone although parts of it remain. The same scene in September 2011. 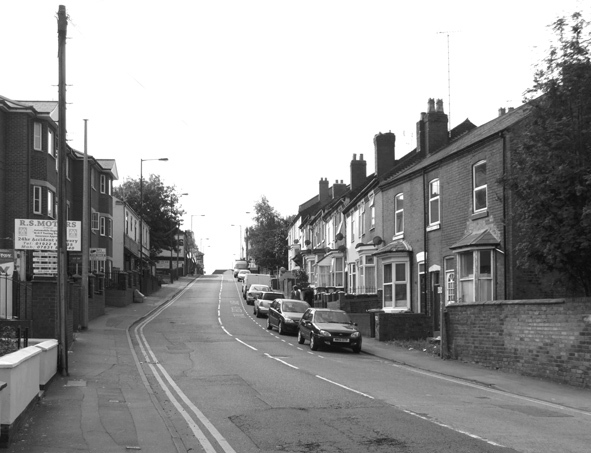 Predominantly a residential area, Sutton Road did house several businesses. 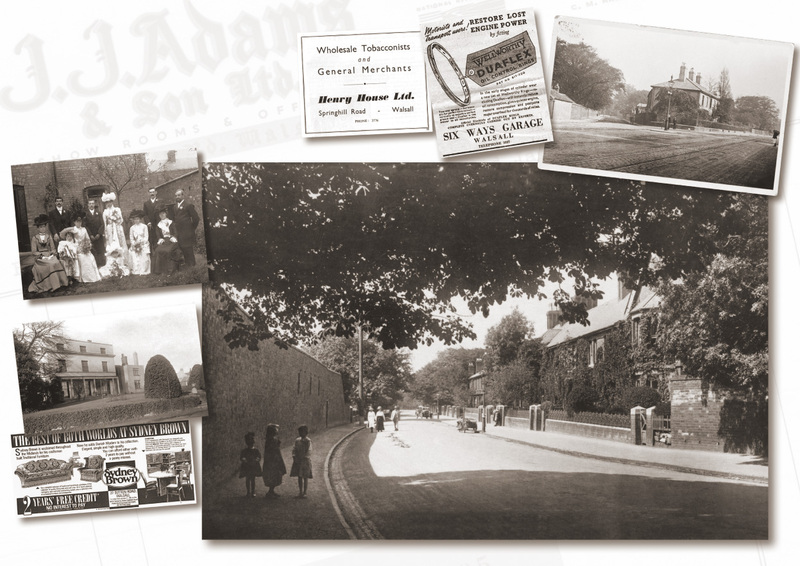 In the background on the main page is an invoice from J. J. Adams & Son Limited whose furniture showrooms were on the right hand side of the road just behind where the photographer was standing. In later years the premises were occupied by another quality furniture dealer, Sidney Brown, who relocated from The Bridge. The wholesalers Henry House Limited and Six Ways Garage, both now long gone, were located by the island at Six Ways. The picture above Brown’s advertisement shows Mayfield, the prepatory school for Queen Mary’s Grammar School. The wedding photograph shows the marriage of Alfred Turley and Maud Abbott in the summer of 1901. They later resided for many years at number seven Sutton Road. The Abbotts were related to the Stammers family, a name that later became familiar in the town through Edgar Stammers Limited, the clothing manufacturers. Young Edgar is unfortunately not included on the photograph although his parents and young sister are. His father William is standing second from the right with mother Julia seated on the extreme left, Gladys their daughter is seated in front of the bride. On the far right is the vicar that married the couple at Vicarage Walk Baptist Church, the Reverend Hampden-Lee. In the main picture, which was thought to have been taken in the late 20s early 30s, a proud Frederick Hewines stands in front of his delivery cart with Victor Hearn ‘steadyin’ th’oss’. The Hewines family were somewhat of a small baking dynasty around Caldmore and Chuckery areas in the early part of the last century. Fred was the son of a baker as were two of his siblings, John Arthur and Leonard. 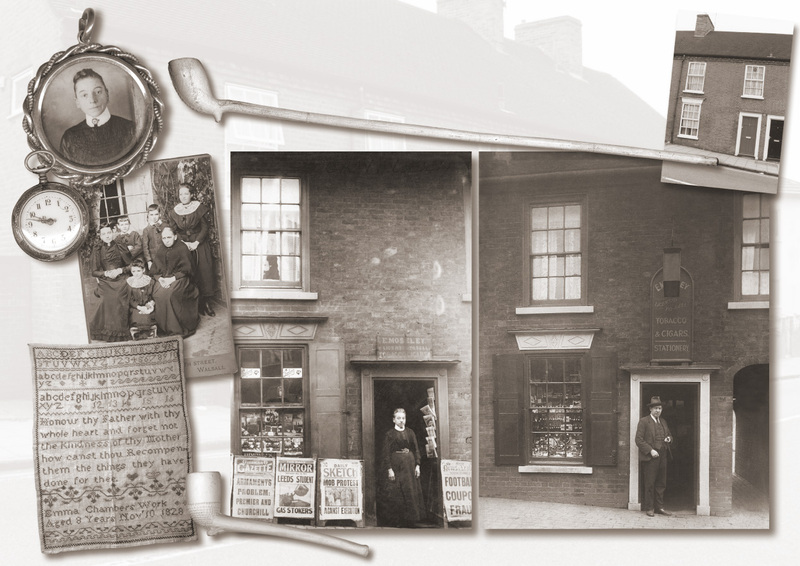 Fred set up business first in Tong Street later moving to West Bromwich Street. His brothers John and Leonard were in business in Thorpe Road and Whitehall Road respectively. They also had an uncle and cousin, both bakers, living and working in the Chuckery. The Walsall Red Book for 1931 lists no fewer than forty-nine independent bakers dotted around the town.Another of these bakers/confectioners remembered by older Walsall residents was Ditchfields in Ablewell Street. The picture bottom right shows their empty premises, the dark brick building, still displaying the ‘Hovis’ sign on this picture, taken in 1998. 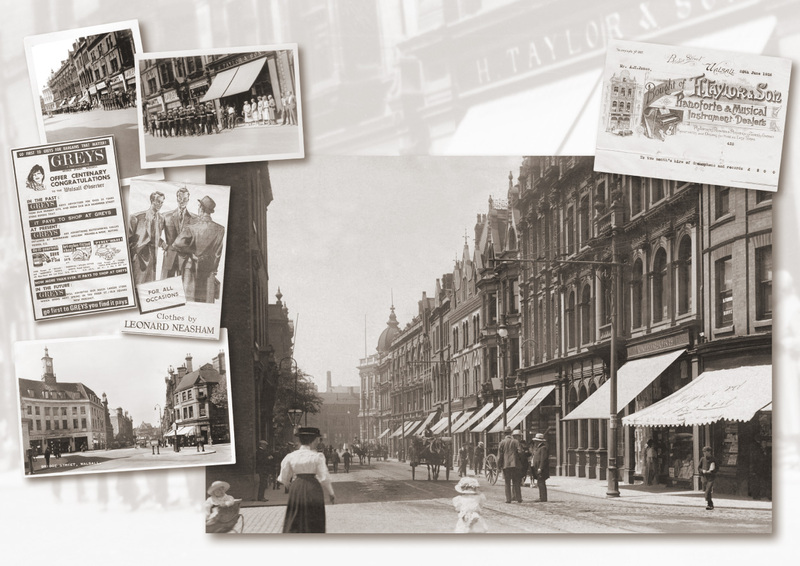 A little nearer the town centre on the same street was Taylors confectioners whose shop is seen at the top right of the main picture with two of the assistants posing for the photographer. 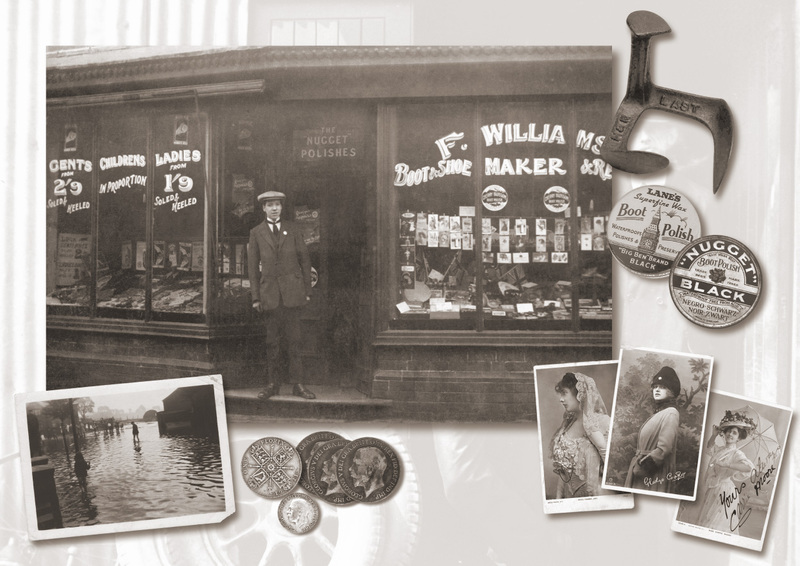 This Cannock based company had several shops in and around the district. Another much larger baking dynasty that began in Walsall, being based in Jessel Road, was that of the Price family. 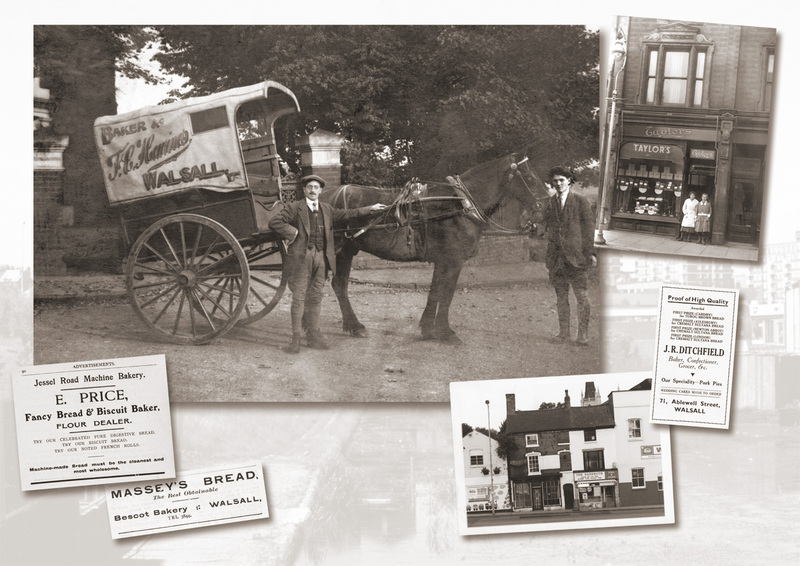 Started by William Price at the tender age of sixteen and helped by his brothers and other relatives, the business grew to become the largest chain of bakers in the UK, marketing their produce under the ‘Harvestime’ banner. The small advertisement is for E. Price, fancy bread, biscuit and flour dealer. Playtime was something every child of school age looked forward to during the day but come the holidays it was fun everyday, all day, for a few weeks at least! The most popular fair that visited Walsall was that of local resident and dignitary Pat Collins, but the one shown in the main picture is that of G. M. Studts, a firm with origins in South Wales. The picture shows the simple pleasures of the fair in the late 1920s on the site in Corporation Street which older residents will remember well. Just to confirm this, the site which today is an industrial estate, has an entrance road called Fairground Way. 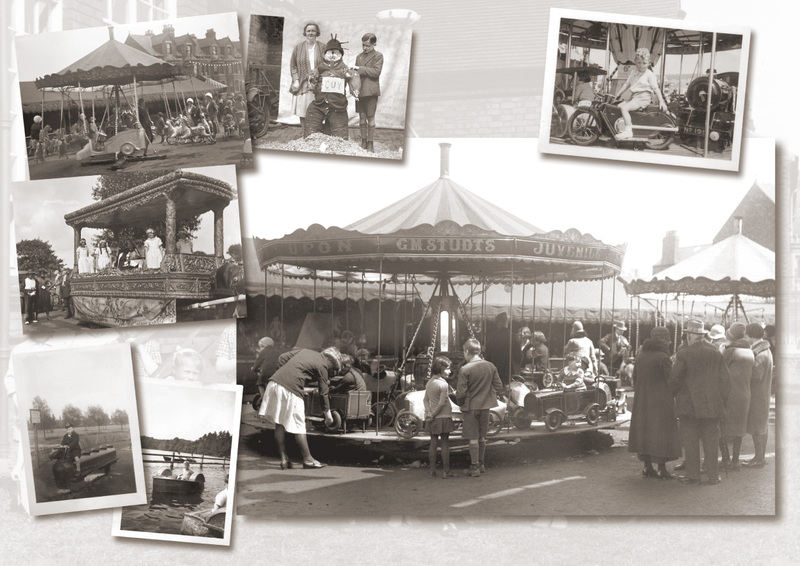 To go to the fair you needed pocket-money but if funds were low a trip to either ‘the Arbo’, Pleck, Reedswood or Palfrey Parks were sure to fill the day with innocent fun….and as one got older…… not so innocent fun. Even during playtime in those days we wore our school uniforms along with the obligatory tie as can be seen by six-year old Michael riding the five seater brown horse in ‘the Arbo’ in 1953. The same little chap can be seen working up a sweat in the boating lake at Blackroot Pool, Sutton Park. The smaller picture top right shows Michael again enjoying himself on a Pat Collins fair ride in Corporation Street around 1953. When the summer had gone and the days were getting shorter there wasn’t much to look forward to except half-term in October and…….bonfire night! Then streets were full of snotty-nosed kids pleading for a ‘penny for the guy’. Some ‘guys’ were pathetic examples of the human form and others, like the one in the smaller picture, were ‘well stuffed’. The end for that particular guy would be quick and painless as he looks to have been stuffed with wood shavings! 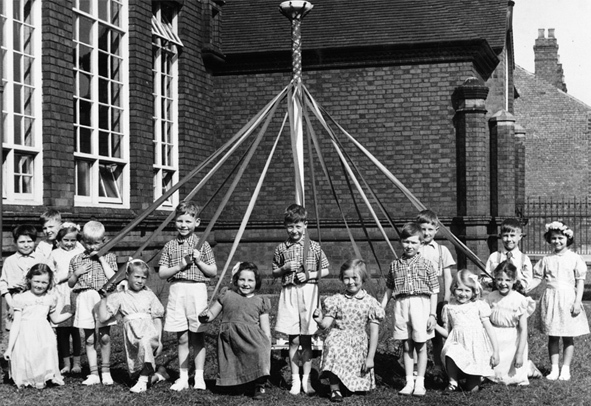 This picture left shows the children of North Walsall Infants School posing around the maypole c.1954 ……..even schooldays were fun then! 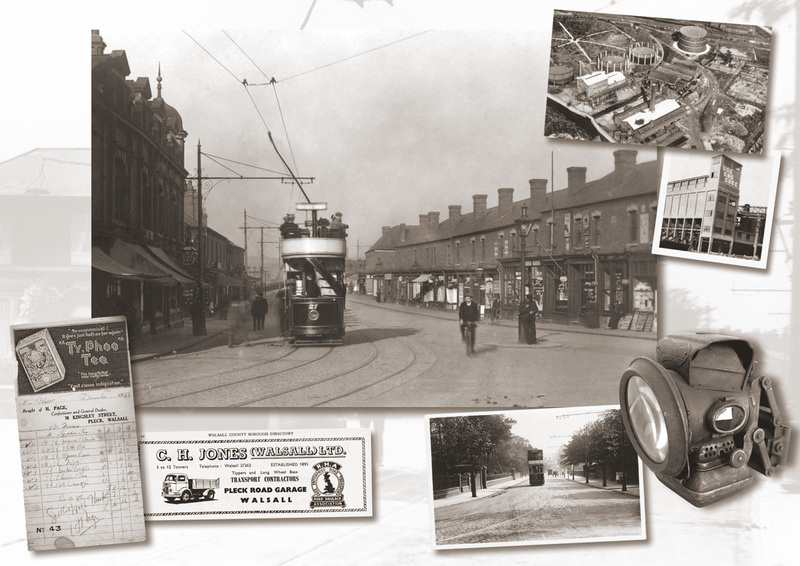 The main picture for this month shows Vicarage Street, now Caldmore Road, in 1913. Little has changed on the right side of the road as can be seen by the picture above taken from a similar vantage point in July 2011. On the left side of the road many of the houses have gone and been replaced with modern flats. Although ninety-eight years have elapsed between the taking of the two photographs the street remains the same now as then, a combination of housing, businesses and a place of worship. Almost in the centre of the picture at the top of the hill can be seen the Vicarage Walk Baptist Church, built in 1878, whose minister was the Reverend Hampden-Lee who can be seen on the wedding picture on the page for June. The premises are now occupied by the Mandir Baba Nath Temple. 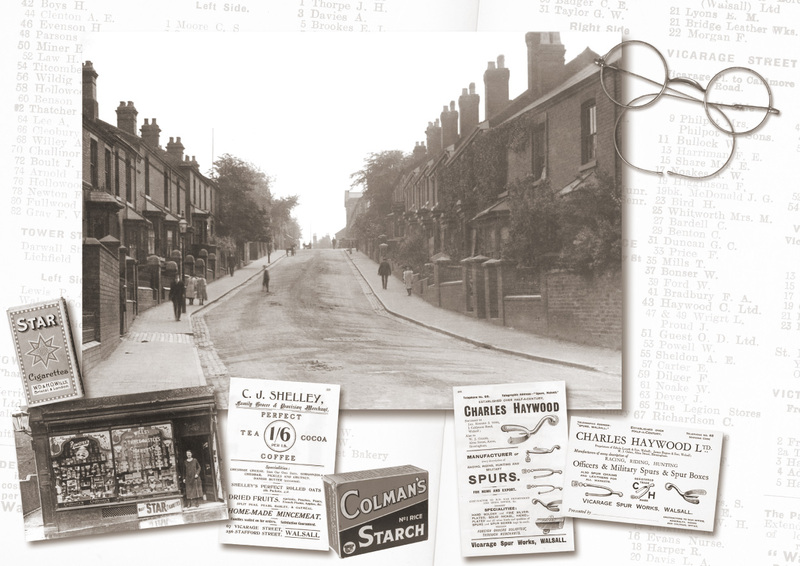 In the bottom left of the main picture is the shop occupied in the 1930s by L. Wright at forty-seven and forty-nine Vicarage Street. The shop is adorned with advertising for products now long gone, Wills Three Castles and Star cigarettes, Rowntrees chocolate. One familiar name that does remain is that of the now American owned Cadburys. Wrights was the kind of shop where you could buy anything from fags to starch, and everything in between. The 1912 advertisement for C. J. Shelley, family grocer at number sixty-seven, shows ‘Perfect Tea, Coffee and Cocoa’ at 1/6d per pound or seven and a half pence in today’s money. Their specialities include gorgonzola, cheddar cheese, pickles, chutney as well as perfect rolled oats and home-made mincemeat, probably fags and starch too! 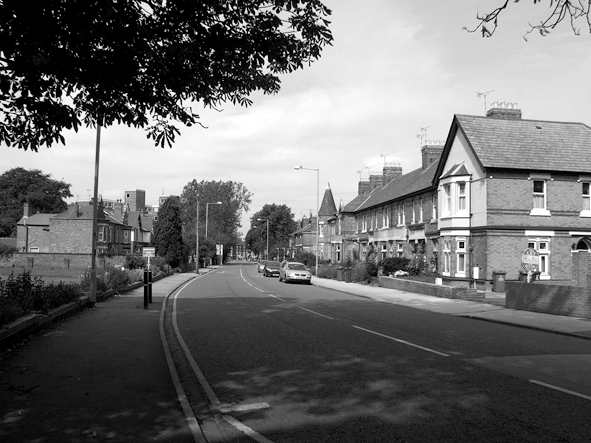 The same scene in September 2011 but now known as Caldmore Road. The other advertisements are for a business resident in the street for many years, Charles Haywood Limited at Vicarage Spur Works, next door to Wright’s shop. The main picture featured this month shows a busy scene on The Bridge in the mid 1960s. The two girls on the crossing will now be as old as the lady behind them! In the background can be seen familiar names from the past, George Masons the grocers, Timothy Whites the chemist, Bakers Shoes and Pattisons cake shop. The latter was previously known as Dora Cafe owned by Coole’s Confectioners & Caterers. Above the premises of Masons and Bakers one can just see the factory that housed E.T. Holdens, the leather curriers. The smaller picture in the bottom right shows a similar scene of The Bridge some forty years earlier, little had changed although the pitched roofs over Masons had been replaced. These were the days when the town had public conveniences in abundance, the ladies and gents can be seen either side of the Sister Dora statue, and certainly in the gents, navy blue enamel signs adorned the walls, reminding you that you were there for one purpose only! The picture bottom left shows The Bridge from a different angle bringing the George Hotel and Bridge Street into view. This picture is dated around the mid 1950s. The ‘four faced liar’ can be seen on the left, this was the clock on The Bridge that reputably told a different time on each of its four faces. Below and to the left of the George entrance was Keys Limited, the well-known electrical and cycle dealers, their window displays banners advertising Hercules Cycles…..with a fifty-year guarantee. If any reader has one of these cycles in the shed or garage, just a reminder, your guarantee is nearly up! The 1952 newspaper advertisement for Keys promotes the virtues of Phillips Cycles made in nearby Smethwick. It really is a case of meet my ancestors for this month’s page which shows the home and business premises of Emma Moseley (née Emery) at 2 Caldmore Road (Little Caldmore today). The first picture shows Emma standing outside her little shop on Thursday 13th December 1913. She was born in Lichfield in 1855 and married Henry Moseley in 1875 at St. Matthew’s Church. In 1886, and parent to four young children, Emma was widowed when Henry died aged thirty-six. With no means of income she began selling newspapers from the doorstep of number two to support her young family. The business grew and she became licensed to sell tobacco, cigarettes and other smoking associated sundries as well as stationery items, the Stephen’s Ink signs can be seen in the windows. The family photograph from around 1895 shows Emma with her four children William, Henry, Sarah Ann and Patience, along with her stearn looking mother, Emma Emery (née Chambers). Below the picture is a sampler completed by Emma senior in November 1828 when she was eight-years old. The broach containing Emma’s picture was a regular feature in her every day dress and the watch shown is one of two she owned. This one is her ‘Sunday best’ watch. When Emma died in February 1926 her unmarried daughter Sarah Ann who lived at home finally married her long time fiancé (mother didn’t approve! ), Francis John Richardson. He can be seen outside the shop in the 1930s. A great character was Frank, ‘chalk and cheese’ him and Sal’ as he called her, nevertheless they ran the shop for almost forty years and lived happily together. The shop finally closed after Frank’s death in 1962. The small picture top right taken in 1998 shows the cottages, which were built-in 1824, after they had been modernised in the mid 1980s. A happy group of children from Palfrey Infants School in the late 1950s greets us on this page posing for the camera after acting out their Christmas play…..with a witch in the cast? The smaller nativity picture was taken at North Walsall Infants School in 1952 and the glum looking cast of this production look more affected with stage fright than their counterparts at Palfrey. 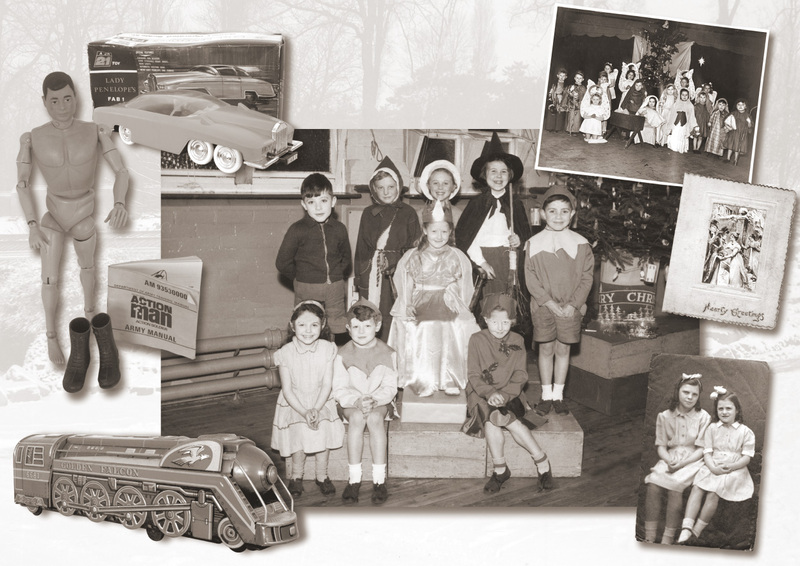 In the bottom right of the main picture are two more girls waiting for Christmas, Mavis and Margaret Higgins from Whitehall Road, also pupils at the Palfrey Schools. One of the toys available that filled up many a Christmas stocking from the mid 60s onwards was Lady Penelope’s car, FAB 1, made famous in the Thunderbird television series. The six-wheeled Rolls Royce was finished in glorious pink and came with figures of the Lady Penelope and her chauffeur Parker. The message on the original box issues the warning, ‘Elegance, Charm and Deadly Danger’. In the opposite corner is a Golden Falcon railway engine, a large battery operated toy made in Japan in the mid 60s. It was beautifully finished in blue, black, red and gold printed tinplate and came complete with working headlight, whistle and emitted smoke when running. Another great icon in the toy industry that was ‘born’ around this time was of course Action Man. The model shown, except for his boots, is as naked as the day he was moulded in Aldridge in the 70s. Although his uniform is long gone the ‘Army Manual’ remains. If you should come across the tattered remains of it in the loft you can restore him to something like his former glory. The tasteful Edwardian Christmas card on the right, from one-hundred and two years ago, shows a very sedate, peaceful scene. It was sent by Mr and Mrs J. Lees of Rutter Street wishing ‘Hearty Greetings’ to family and friends at Christmas 1909. Just one more calendar to go, the 2013 edition will be posted in the next few weeks. 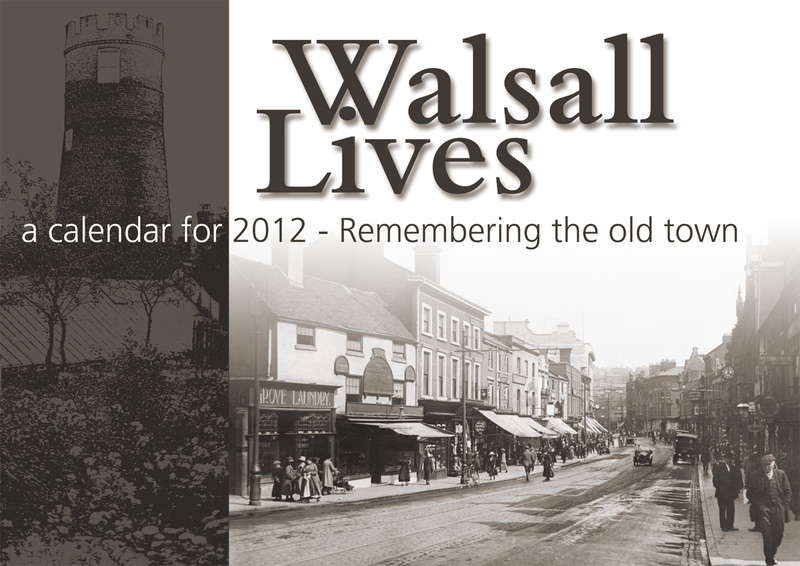 You are currently reading Walsall Lives 2012 at Walsall Life.